Chris came to Literacy Services of Wisconsin at his mother’s urging. As a reading specialist for Milwaukee Public Schools for 30 years, Sara had helped her son as much as she could to overcome his reading disability. When she retired and became a volunteer at LSW, however, she realized how much Chris could benefit from enrolling there. Despite graduating from Nicolet High School, Chris was not able to read or write proficiently. Chris knew his dreams of college-level study would certainly require these abilities. Fortunately, he had the support of his mother and his father, David, who is an architect. His parents helped him enroll at LSW and he began to receive intensive phonics instruction in 2009. For several years, Chris worked with his tutor and faithfully met twice a week to help Chris achieve his goals. As his literacy skills improved, he took horticulture classes at a local community college while continuing his studies at LSW. Though he worked two part-time jobs, he always scheduled his work around his classes. He credited the one-on-one instruction he received at LSW for helping him improve his reading, writing, and test taking skills. “My teachers, they noticed my improvements. I was able to work more on my own versus always asking for help,” said Chris. Chris persisted with his studies, despite several family tragedies over the years, to accomplish his dream of earning his Associate’s Degree. When his mother passed away in January 2013, Chris was compelled to honor her memory by continuing to achieve. 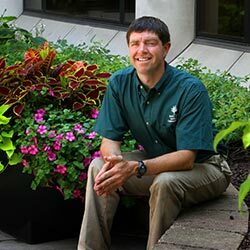 Indeed, Chris completed his studies at LSW in spring of 2014, and followed that by earning a Master Gardener certificate through the UW-Extension system. 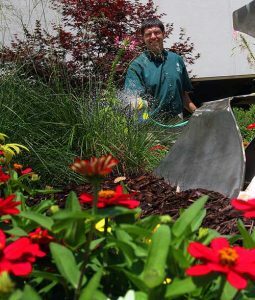 He was hired full-time in the spring of 2015 to work for David J. Frank Landscape Contracting, Inc.
As a student of Literacy Services, Chris’ friendly demeanor and outgoing nature helped many other students feel comfortable and welcome at LSW. “Keep striving ahead” was the advice he offered his fellow students. That inspirational message is continually validated by his ongoing success.